The Grand Union Orchestra is the acknowledged pioneer and leading exponent of cross-cultural music-making in the UK. Once memorably described as ‘making cultural diversity an art-form’ – and more recently commended for its ‘practical idealism’! – it continues to blaze a trail unrivalled by any other organisation. 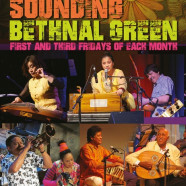 Sounding Bethnal Green is a development of Trading Roots, re-imagined for a series of events on the first and third Friday of each month at St John’s, to bring to the attention of local residents the extraordinary variety of people and cultures on their doorstep. Combining performance, interview, discussion and practical workshop, and led by professional artists from China, South Asia, Latin America and Africa, they will highlight the remarkable demographic of the neighbourhood and its history through music and musicians flourishing locally. As much a social as a cultural event, Sounding Bethnal Green is a series of informal evenings combining performance, interview, discussion and practical workshop. Led by professional artists from all parts of the world who have settled in East London, they will highlight the remarkable demographic of the area, its history and the music flourishing locally. Come along and listen, join in, contribute and, of course, meet your neighbours! Bar open throughout. Admission: pay what you can. 1 February: Focusing on the South African diaspora, led by trumpeter Claude Deppa and singer/percussionist Marcina Arnold. 15 February: Celebrating Chinese New Year with the music of East/Southeast Asia, led by gu zheng (Chinese harp) virtuoso Zhu Xiao Meng from Shanghai. 1 March: Focusing on music and musicians from Bangladesh and Southern India – artists to be announced. 15 March: Focusing on the music of Somalia and the Congo. 5 April: Led by Bulgarian percussionist Lilia Iontcheva, focusing on the songs and dance rhythms of Eastern Europe and the Balkans.